You can use the Sx2 Dongle (www.sx2dongle.com) to take away your electric bikes 25 km/h speed limitation and to shift the motor support up to 50 km/h. The Sx2 Dongle is a very easy solution if you want to make your electric bicycle faster. One of the big advantages of this tuning tool is its pluggable design. That means you can remove the Dongle at any time if you want to undo the tuning again. The Sx2 Dongle is integrated into a compact, pluggable 3,5 mm jack plug which simply has to be connected parallel to the speed sensor. By the way, the Sx2 Dongle requires no battery. The device causes no changes in the engine electronics and all engine assistance levels will be retained. If you want to undo the tuning, simply pull off the Dongle. After that is done, your electric bike will be back in its original condition and you can use it legally on public roads again. No other tuning tool is as simple. How does the Sx2 Dongle work? The operating principle of the Sx2 Dongle is quite simple: After the Dongle has been connected it will divide the transmitted speed when the driving speed reaches approx. 20 km/h so that only half of the real speed will be displayed. Now the engine assistance will not stop at 25 km/h anymore and you can drive up to 50 km/h with the motor power still supporting. The Sx2 Dongle is very robust and 100% outdoor suitable. 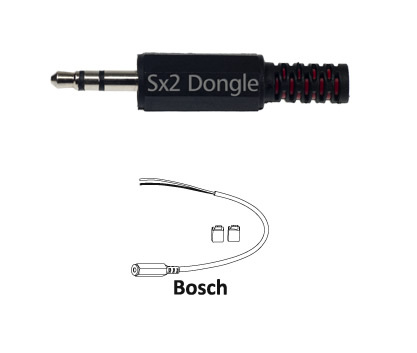 Owners of electric bikes with Bosch engine got the option to choose an Sx2 Dongle with “Power Switch”. This makes it possible to turn the Sx2 Dongle on or off conveniently via the light switch. Does the Sx2 Dongle even work with S-Pedelecs ? The Sx2 is compatible with S-Pedelecs driven by 350 W engines, too.